Among the few fortunate devotees, who came to Swami in the early years of His avatharhood, Mr Raja Reddy is exceptional. 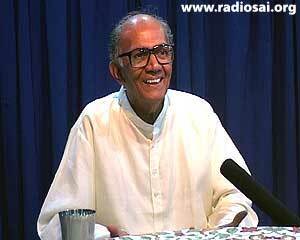 He was one of the most privileged who came to Bhagavan as a teenager and continued to stay in the Divine Presence enjoying His blissful divine proximity for nearly three decades. A sincere spiritual aspirant right from his childhood, the story of His encounters with ‘The Eternal’ is most fascinating. 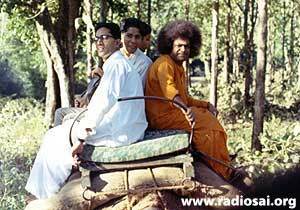 We had an enthusiastic Sai worker go over to his home in Mumbai to interview him and below is the transcript of the second part of that conversation. We had the first part in the October issue. RR: Everything is an open book to Him and He wants transformation in each one of us. We are many a time ‘an absolute alien’ to our self, not knowing anything at all! Q: He goes through our minds without any barriers! RR: Oh yes, like open books. I have no doubt about it; it’s a common experience, as common as drinking water. Q: Tell us more about those experiences. RR: He has His own inimitable ways. 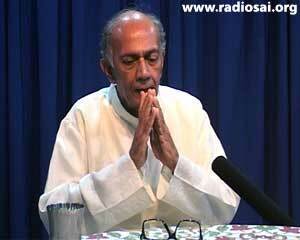 Bhagavan had given me the opportunity to sing bhajans. 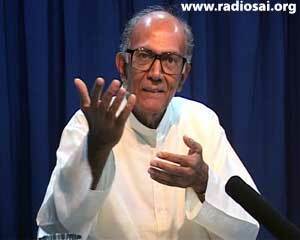 I was leading bhajans for decades, right from 1958 until 1983; that is, up to my 60th year. Q: That is more than twenty five years! RR: Yes. 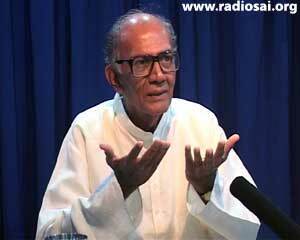 When I was 60 years old, one day, as usual, I started a bhajan. All the students were singing with fresh and blooming voices. Naturally, Bhagavan wanted to give them more chances and I was also getting superannuated. So one fine morning as I was sitting there to sing a bhajan, all of a sudden the mike was taken away from me. 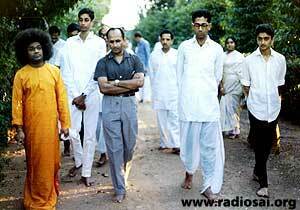 Being with Him for so many years, I ‘knew’ of Swami’s ways and could get the hint. So I didn’t react at all. Then, after the bhajans were over and aarti was performed, Swami just looked at me; it was just a glance, but very deep. Believe it or not, for about 2-3 days, I was just floating in bliss. Just a look, nothing else! But it was a completely out-of-the-earth blissful feeling! So that was a wonderful experience I had. That was His superb indirect lesson. Only you must be blessed by Him to take it in the right way. You can’t revolt, ego doesn’t play a part. 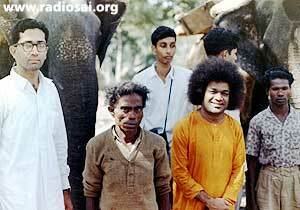 Q: What was the first miracle of Swami you witnessed after you started visiting Parthi? RR: Miracles had become such a common place occurrences with Baba that they ceased to be miracles! I used to hear of Baba materializing vibhuti, and when I came to Him I was mentally prepared for it because my mother was an old devotee. I have seen quite a few interesting incidents. Swami used to go in a ‘trance’, meaning, He used to, so to say, leave His body whenever there was any danger to any devotee, anywhere. What used to happen is that His body would become almost like a rigor mortis – almost death-like. And it would fall like a stick. So, as attendants on Him, we had to take care of His body by not allowing Him to fall or get hurt. On one of these instances, I was not very well acquainted with this process of His ‘trance’ and while He was ‘gone’ from His body, He went on pulling His hair and had quite a handful of His hair in His hand. Then He asked for water, which I readily gave. Next, He swallowed the hair and washed it down with water! Later, when He returned to normal consciousness, He asked me, “Did I swallow any hair?” I said, “Yes, Baba.” Remember, I was not acquainted with these divine acts. Even one hair is enough to damage the digestive system; and this was a whole bunch! Just then, He opened a button and what happened next was something unimaginable. The hair which was wet, which He had swallowed, was coming out from underneath His heart! That was something mind-boggling. Q: Any instance, where you could recall where He could tell somebody’s past and future. RR: As I told you, I was a worshiper of Swami Vivekananda. Baba would say, “You will just pick up Viveka (which means ‘conscience’) and then play with him.” I thought, as I was so full of Vivekananda and his ideas, I would, spiritually, go to such heights. But what really happened was, after I was married, He named my son Viveka. And that’s how he played this prank on me. But imagine, Swami said this many years ago, in fact, decades before my marriage! He had no connection with my marriage whatsoever. Q: It was a good joke! Q: Swami has such a good sense of humour. RR: Tremendous! We used to burst into peals of laughter when He used to impersonate somebody so perfectly. Q: Have you witnessed any instance of ‘divine healing’? RR: Once I was suffering from piles and experienced profuse bleeding, as a reaction to a wrong homeopathic medicine that was given to me. And I had to go to Bhagavan as there was a function and I had to participate in that procession. So I told Bhagavan about my situation and immediately He gave me prasadam. Believe it or not, the moment I took it, the problem was gone! It was not a joke! I used to suffer for days because of bleeding piles. I will narrate one more incident. This concerns my wife’s cousin, Mr. Suresh who is a sincere devotee of Bhagavan. 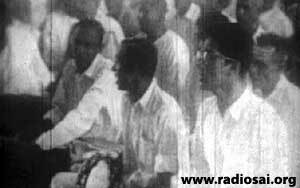 At that time, he was probably in his thirties and was well qualified with a Chemical Engineering degree and an MBA done in Ahmedabad. He was highly placed too in his profession. Suddenly he developed cancer in the thigh. Remember, he was young and had two small kids, a boy and a girl. He went to Dharmakshetra (Mumbai) to have Baba’s Darshan and there Baba saw him and said, “Yes, cancer cancelled!” Mind you, that was a very dangerous type of cancer and he had been given an ultimatum of six months by the doctors. He had tried chemotherapy and everything else by then. Q: He is still around? RR: Yes, hale and healthy after decades! He has a job in a German Company in Pune, India, and he is on the move, globe trotting 15 days in a month. His son and daughter are well placed too. Therefore, He is very vivid about the entire past, present and the future of everybody. All the states of consciousness – waking, dreaming, deep sleep and complete bliss – are under His control. Here is one instance. Everybody in my wife’s family is a staunch devotee of Shirdi Baba. In fact, my wife’s grandmother and grandfather had been to Shirdi and had darshan of Shirdi Sai when He was on earth in His physical form. At that time, her grandmother was pregnant with her father. There are two facets implicitly stated by Baba in this incident. First: ‘I have complete control over jagrat, sapna, sushupti’ (waking, dream and deep sleep states). Second: ‘I am the same as Shirdi; Shirdi Sai and I are not different.’ In her dream Shirdi Baba gave her a rosary and she was woken up by somebody, and she was unhappy for having been disturbed. And here, Baba completes the dream! It is something fantastic! And not only that, if this is on the curative side, on the preventive side, He gives us water so that we don’t succumb to any diseases in the first place. It is indeed unbelievable! Everything is offered free. Q: When has been the transformation in your life after you met Swami? RR: As I explained earlier, when I came I had little respect for miracles, and it was common place for Baba to do miracles. He used to pluck a seethaphal (custard apple) and by the time it reached your hand it would turn into an apple! These instances were happening all the time. He used to take a slab of stone and throw it up, by the time it returns it would turn into a sugar candy! He is, in fact, changing our minds like pots of clay! These miracles are nothing. By his Grace my mind is so evolved! I sit for meditation three times a day and that has been a habit for not years but decades. Even when I used to drive Baba’s car, I used to meditate and drive! That’s because I didn’t want to lose that experience. I told you earlier that I was an incorrigible introvert. I generally don’t tell others these experiences, but I used to feel an inexplicable ecstatic bliss. It was something so fine to experience that you didn’t want to leave it either, but then at times you had to. Baba has very kindly advised us to link our namasmarana (chanting His name) with our breath. Uchwas and Nichwas - when you inhale and exhale, you link His name to that. It could be “Sairam! Sairam!” or whichever name. Then, there is real happiness. Our mind is the horse-rider and breath is the horse; you catch hold of the horse, the rider is automatically in your hand! Q: Do you think there is a difference in the quality of people or kind of devotion now, compared to the earlier days? RR: One can’t delve into people’s minds. People come to Him with many motives - ulterior as well as divine. It was so even then. Yes, there are all sorts of people, but then, it should start somewhere. People do start with ulterior motives and desires, but later, Baba has a way of molding minds like pots of clay - which He alone can do! He is a 'Para-psychologist'; a psychologist, par excellence! I don’t know how far the students have witnessed that, because every mind is an open book to Him; there’s nothing to hide. Ultimately, He wants everybody to benefit from His Avatar. He has come for us and He doesn’t require anything. He is Bliss personified! Q: When you are at your residence now, in Mumbai or in Parthi, do you feel any difference? RR: No, Absolutely not! I don’t miss Him at all. Only I would like to see Him now and then, therefore, twice a year I come to Puttaparthi. In those years, I used to be with Baba, now Baba is with me! There I used to be in His physical presence, now Baba is in me - in bliss! In essence He is with me, so why should I bother? Baba doesn’t talk to me these days, do you know that? But I don’t require His talking! I am absolutely happy and He is guiding me day in and day out!